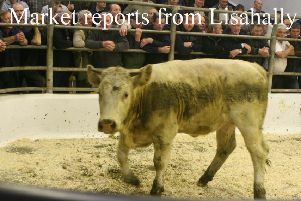 An entry of 952 cattle on offer this week at Thursday’s sales. Lightweight bullocks selling from 215ppk to 267ppk for a Charolais 394kg at £1,050. Medium weights selling from 205pkk to 251ppk for a Charolais 418kg at £1,050. Derrylin producer Charolais 394kg at £1,050, Kinawley producer Limousin 418kg at £1,050, Kesh producer Charolais 420kg at £1,030, Charolais 330kg at £800, Roscor producer Charolais 404kg at £950, Charolais 404kg at £960, Irvinestown producer Charolais 534kg at £1,290, Dungannon producer Charolais 538kg at £1,260, Charolais 544kg at £1,250, Charolais 534kg at £1,185, Fivemiletown producer Limousin 538kg at £1,230, Limousin 542kg at £1,225 and Enniskillen producer Charolais 508kg at £1,125. In the weanling rings steers and bulls sold from £700 to £930 paid for a 336kg Charolais while heifers ranged from £620 to £945 paid for a 360kg Charolais. Belleek producer 336k Charolais bull at £930, 360kg Limousin heifers at £790, 359kg Charolais heifers at £820, 335kg Charolais heifers at £825, Irvinestown producer 412kg Charolais steer at £925, 306kg Charolais bull at £760, 350kg Saler bull at £820, Tempo producer 313kg Limousin bull at £850, 435kg Limousin heifers at £900, 340kg Limousin heifers at £850, Garrison producer 256kg Charolais bull at £850, 267kg Charolais bull at £775, 286kg Charolais heifers at £785, 266kg Charolais bull at £700, 248kg Charolais bull at £780, 332kg Charolais heifers at £785, 309kg Limousin bull at £855, Lisnaskea producer 360kg Charolais heifers at £850, 305kg Charolais bull at £805, 372kg Charolais bull at £930, 415kg Charolais bull at £905, Newtownbutler producer 280kg Limousin bull at £760, 295kg Charolais bull at £835, 335kg Charolais heifers at £805, Lisbellaw producer 346kg Aberdeen Angus steer at £880, 348kg Aberdeen Angus steer at £805, 365kg Aberdeen Angus steer at £790, Seskinore producer 375kg Charolais bull at £850, 355kg Charolais bull at £845, 412kg Belgian Blue bull at £895, Bellanaleck producer 190kg Limousin heifers at £550, 182kg Limousin heifers at £530, 260kg Charolais heifers at £740, Belcoo producer 339kg Charolais heifers at £815, 324kg Charolais heifers at £835, 360k Aberdeen Angus steer at £860 and Enniskillen producer 460kg Charolais steer at £1010, 435kg Simmental steer at £910, 458kg Simmental steer at £975, 475kg Charolais steer at £1050, 435kg Charolais heifers at £945, 370kg Charolais steer at £895. Enniskillen producer Limousin bull at £360, Charolais bull at £330, Newtownbutler producer Charolais heifers at £325, Springfield producer Hereford bull at £325, Letterbreen producer Charolais heifers at £310, Friesian bull at £195, Culkey producer Belgian Blue bull at £295, Kinawley producer Aberdeen Angus bull at £280, Aberdeen Angus bull at £275, Drumcose producer Hereford bull at £290, Simmental bull at £290 and Garvary producer Aberdeen Angus bull at £260. Kesh producer Aberdeen Angus cow with bull at £1,430, Roscor producer Aberdeen Angus cow with bull at £1,360, Omagh producer Limousin cow with bull at £1,380, Lisnaskea producer springing Limousin cow at £1,230, springing Limousin cow at £1,000, Dunngannon producer springing Shorthorn cow at £1,010 and Enniskillen producer Aberdeen Angus bull at £1,250. Forward lots sold to 217ppk paid for a 575kg Charolais at £1,245, while medium weights sold from 190-231ppk paid for a 490kg Charolais at £1,130. Florencecourt producer Charolais 660kg at £1,320, Derrylin producer Charolais 575kg at £1245, Charolais 590kg at £1,200, Letterbreen producer Charolais 480kg at £1,130, Belleek producer Charolais 490kg at £1,105, Charolais 490kg at £1,095 and Lisbellaw producer Charolais 540kg at £1,145, Charolais 530kg at £1,140. Forward lots to 184ppk paid for a 550kg Charolais at £1,015 while lighter lots sold from 102-190 for a 440kg Charolais at £850, Friesian cow from 72-108ppk. Derrylin producer Charolais 658kg at £1,150, Charolais 550kg at £1,015, Charolais 580kg at £1,000, Florencecourt producer Charolais 740kg at £1,090, Springfield producer Charolais 660kg at £1,060, Letterbreen producer Charolais 780kg at £1,130 and Garrison producer Charolais 740kg at £1,135.